Grant McCann certainly cannot be accused of setting the bar too low or downplaying expectations. 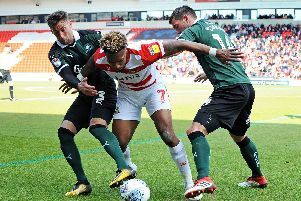 The Northern Irishman said this week that his Doncaster Rovers side can win League One this season. And club captain Andy Butler believes such positive talk can only be a good thing. “I think it can only benefit you,” said Butler. “By saying 'you're the best', some days you are going to believe that you are the best team in the league. “If someone keeps saying 'you're the worst and you're going to get relegated' then it will have a negative impact. “If you put a positive message into players' minds then you start to believe it and you start to walk around with a little bit of a swagger - and then the football comes. “It's the same in every day life. Seventh-placed Rovers welcome Luton Town to the Keepmoat Stadium tomorrow hoping to build on their encouraging start to the season. Butler thinks last weekend’s impressive performance at early leaders Peterborough United, where Rovers drew 1-1 but probably deserved all three points, has boosted belief levels. “I think Peterborough was a big eye-opener for everyone,” he said. “They've averaged three goals per game and won five out of five and we go there and score one and had a goal harshly disallowed. “You want to get into a situation where teams are fearing coming to the Keepmoat. “You can beat teams before they get off the bus. “We did that in League Two. “Teams knew that they were going to get a game here and knew we'd score goals.